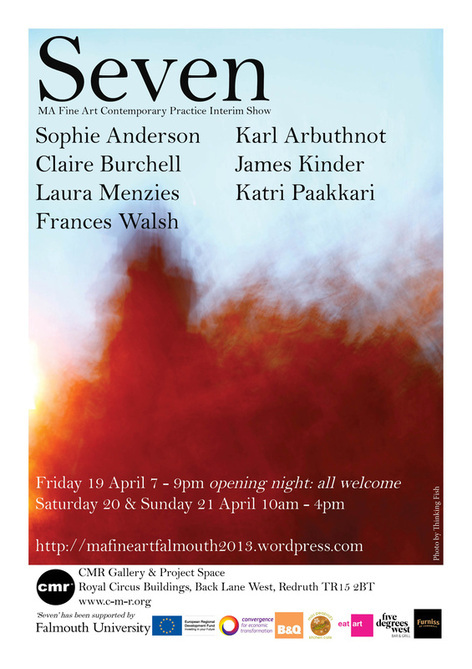 Seven students from the MA Fine Art: Contemporary Practice course at Falmouth University will be presenting an ‘interim’ show of their work at CMR Gallery, Redruth from 19th to 21st April. The artists involved are Sophie Anderson, Karl Arbuthnot, Claire Burchell, James Kinder, Laura Menzies, Katri Paakkari and Frances Walsh. The exhibition includes painting, sculpture, sound, performance and installations, shown in CMR Gallery and in nearby empty shops on Fore Street. “The MA Fine Art course requires students to exhibit their work in public mid-way through the programme. We were fortunate that CMR Gallery accepted our proposal for the show to be held there. As an artist-led organisation, they have offered invaluable support in the development stages of the exhibition. There will also be art pieces located in empty shops on Fore Street, facilitated by local arts hub, Krowji. This is the first public exhibition of our current work and some of it is very much still work-in-progress. We look forward to gaining feedback on our work from gallery visitors before we start preparing for our final MA show in the late Summer.” - Frances Walsh, MA student.